In the case of Certain Noble Plays, the significance of its publication was that Pound (as well as William Butler Yeats) felt that the Noh plays could revitalize Anglo-American poetry and drama in ways that suited modernist aesthetics. One might wonder if the same intention lies behind the reprinting of Proensa—if these troubadour poems are appearing again to twenty-first century readers to revitalize poetry and performance using literary forms from the past. and the baggage with it. One can imagine the kind of raucous entertainment that the performance of troubadour poetry provided for contemporary audiences. The dexterity with which Blackburn employs language to which modern readers can relate does more than any scholarly annotation to depict the impact that troubadour poetry had on its original audiences. 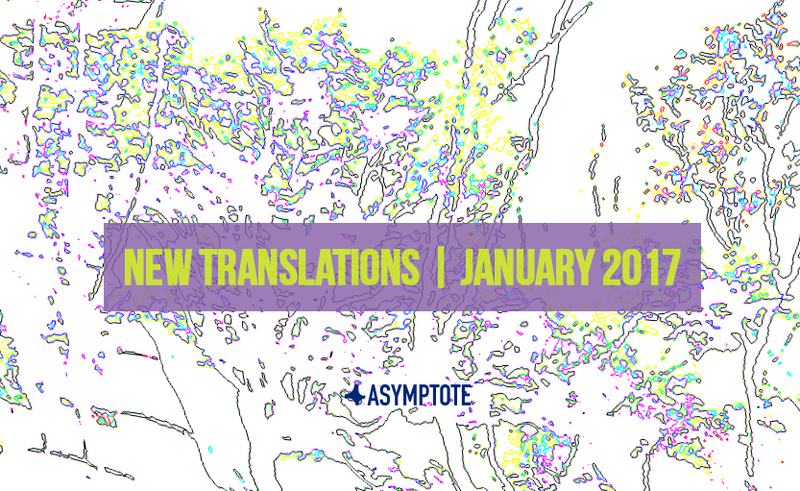 The translations are able to stand on their own without the distraction of annotations, putting poetry before scholarship. What scholarship the text provides is located in the endnotes, and even these provide minimal historical or social context. In the case of poetry by the trobairitz [lady troubadour] Beatritz de Dia, further extensive context on the rarity of a trobairitz might be useful for modern readers interested in the gender biases that female poets had to work against in the twelfth century. However, in his presentation of Blackburn’s poetry, Economou employs a fairly light editorial hand, respecting the integrity of Blackburn’s translations. Unlike Pound, whose heavy-handed editorial intrusions on the Noh plays has received much criticism, Economou makes his editorial presence subtle and nearly unannounced. The posthumous publication of Proensa, made possible by Economou’s supportive work for Blackburn’s translations, adds a new level of interest to these troubadour poems and brings to light the oft-obscured relationship between editors and translators. In some ways, one might look at Economou’s work and introduction for Blackburn as similar to the way a vida functions for a troubadour poem, shedding light on the poet’s life and allowing us to get “into other people’s heads.” The troubadour poems themselves are fascinating and occasionally offensive, features that rather than alienate modern readers in fact allow them to connect to twelfth century audiences through vernacular and low-brow humor. Paul Blackburn’s insightful translations continue to make the troubadour poems relevant and interesting today, and perhaps with the reissue of Proensa we shall see changing tides in literature. 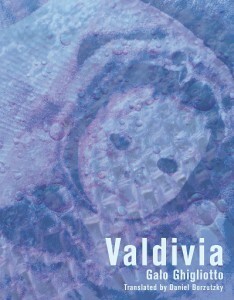 Valdivia, Chilean author Galo Ghigliotto’s most recent book of poetry, translated by Daniel Borzutzky and published by co • im • press, takes on various textures of lived histories and the confluence of poetic and geographic space. How does Valdivia—Ghigliotto’s birthplace and a city due south of Santiago—coincide with Valdivia, the realm of crossed memories, ghosts, mythical spirits, remnants of physical and psychic violence? And if, as Ghigliotto reminds his reader in his preface, “…the emblem of Chile is violence,” how does the book hold the incomprehensibility of this violence within its pages, how does it question the power structures that give it a place in the world? These are just a few of the essential questions that course throughout the book. The opening poem orients the reader toward the way the elemental collides with the imaginary, the imaginary creates violent and unexpected shifts, the banal often appears ominously austere (“molars made of gel” aside the heavy, flat-sounding “rectangular plastic vacuum / packed,”), and the sensory—the deep tones of “blue petroleum / dark calypso”—lends an important wildness to the poems that becomes one of their unifying elements. 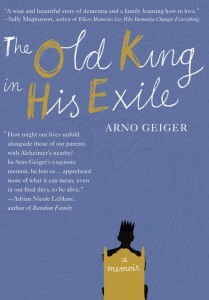 The Old King in His Exile is Arno Geiger’s clear-eyed and lyrical account of his years as quotidian companion and caregiver to his elderly father, August, who suffers from Alzheimer’s disease. That August has become the titular “old king in exile” suggests a sad irony because other than two years in the 1940s, when he was a conscripted soldier and prisoner of war, August never strayed from his birthright: a small plot of land in the village of Wolfurt, Austria. For August, home is the lodestone of his life, a place that he did not want to leave even for a quick family vacation because, “Wolfurt was lovely enough for him.” And yet the disease cruelly displaces August both emotionally and cognitively; it deprives him of the familiarity and sense of belonging that is the essence of feeling at home in a place and with one’s self. The memoir depicts Geiger’s reluctant acceptance that his father cannot be the same person that he was prior to the disease and also his wonderment to discover that, in spite of the changes, he and his father can experience moments of real joy together. This acceptance comes about only after Geiger acknowledges that it is not possible to force his father into an understanding of the world as it actually is. Instead, he must cross the bridge into his father’s reality and engage with him from that place. To give someone with dementia an answer that, according to the usual rules, is objectively correct, but which pays no attention to the place where that person finds him-or herself, is to enforce a world that isn’t his or her own. Although the disease scrambles August’s mind, Geiger is amazed that, from time to time, August is able to acutely perceive his own vulnerable state and express his thoughts and feelings with disarming precision. It is almost as though his father gains a special type of perception—his confusion and disorientation are coupled with an ability to intuit his situation and face it without pretense or posturing. Geiger is rightfully proud of the kind, gentle, and thoughtful man that his father continues to be, in spite of the disease that wracks him. Even with his dementia, August is a man who loves to sing, who lights up in the company of others, and who (most often) is patient and affectionate. He is a “king” beloved by his family and his neighbors for being gracious; valuing honest, hard work; and taking pride in protecting his home kingdom. Arno Geiger’s memoir is a gift to the very many of us who love someone with Alzheimer’s disease. The author’s message is one of humble gratitude that this debilitating disease has not entirely extinguished his father’s warmth and kindness nor the quiet dignity of this exiled king.